The Hailsham Town Council offices in Market Street continue to house its resident and visitor information point situated in the front reception. 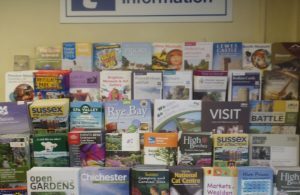 Visitors to the town and residents are being offered a one-stop pick-up point for all enquiries and a wide range of locally produced leaflets, brochures and other information is readily available. The Town Council’s information point is staffed to offer free help and advice for day visitors and group travel organisers on attractions, guided tours, festivals, accommodation and events in the locality, as well as details on places to visit in nearby areas. Free help and information is also available to residents on local and council services, community safety, general consumer advice and public transport – including timetables for local buses. “Our information displays contain excellent sources of information on a number of different things. Furthermore, copies of the latest Town Council Newsletter (Our Hailsham), Hailsham Town Guides, area maps, and information on some of the town’s public open spaces are available for people to read or take away. Hailsham Town Council’s resident and visitor information point is open to the public Monday to Friday from 9.00am-4.00pm.